Adele donated eight pairs of tickets for her London shows to raise money for Great Ormond Street Hospital. The 'When We Were Young' hitmaker teamed up with the Give to GOSH charity to give lucky fans the chance to see her in concert at The O2 this year by handing over the tickets for a prize draw. The 27-year-old singing superstar's support for the campaign started by The Independent and London Evening Standard newspapers to provide funds for the world renowned children's hospital follows in the footsteps of Sir Paul McCartney, Johnny Depp and David Beckham, who have long supported GOSH. Tim Johnson, chief executive of Great Ormond Street Hospital Children's Charity, said: "It is so wonderful that Adele has backed our appeal in such a generous way. These tickets are like gold dust and it's fantastic that we are able to offer readers a chance to win them in a way that will also support the Give to GOSH appeal. Adele is a record-breaking artist and this has been a record-breaking charity appeal so this feels like a fitting way to see out the final week of this incredible campaign." 'Adele Live 2016' has become one of the most highly-anticipated live shows of the year, with tickets selling out in minutes. 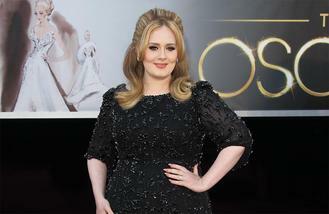 Adele will perform at The O2 for eight nights from March 15 to March 22. Twiggy appeared on the front cover of David Bowie's 'Pin Ups' album by chance. Beyonce and Mariah Carey have reportedly held talks over making a duet together. Hurts brought romance to London's O2 Academy Brixton on Saturday night (13.02.16). Louis Tomlinson's ex Briana Jungwirth is apparently finding it hard seeing the singer with new beau Danielle Campbell. Pop star Zendaya wasn’t fussed about which song Chris Brown appeared on, she just really wanted to sing with him. The 58th Annual Grammy Awards will take place on 15 February. The who's who of the music industry will attend the star-studded ceremony. Katy Perry will not be attending the Grammys. Kanye West never reached out to Taylor Swift for approval of his new track Famous, despite reports suggesting otherwise. Barry Manilow was rushed to hospital on Thursday night (11Feb16).